This quote holds true for many aspects in life. I believe it is part of the human condition to want to feel productive, worthy, appreciated and noticed. We want to be seen, heard, and understood. As a Marriage Coach, I can assure you that husbands and wives want to be affirmed, acknowledged and cherished. 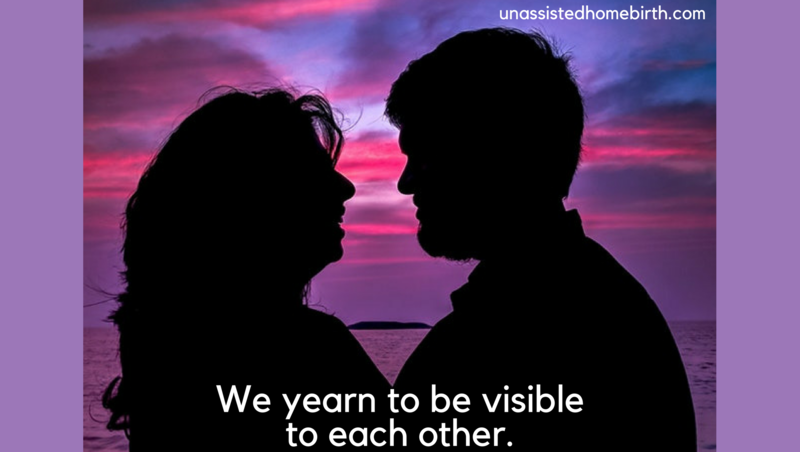 If we are not visible to each other and not emotionally connected, we tend to feel something is missing in our lives; we may be tempted to seek a connection elsewhere. People want to feel important and to be validated. The high participation in social networking tells me that people enjoy interacting with one another, and they especially like being heard. Do you have “friends” who write comments on social media and exit the conversation, but in real life, would not say those things and do not have that kind of courage? They want to matter, and Facebook and other social media platforms are easy ways to be noticed. Birth is another area of our lives where we can be visible. Our birth experiences matter a great deal – if not before or during the birth, then after. Sooner or later, people will ask you to share the birth stories of your children. Women who have a high need for visibility enjoy attention, empathy and sympathy if they've had a dramatic or traumatic birth. The ordinary is not noticed, but the extreme draws compassion. (1)Childbirth is so simple, yet beautiful and miraculous. (2) A woman is not passive during childbirth; she is more than a mere instrument to be managed and needs personal connection. She needs to be treated with dignity and honor. Medical professionals are not part of the woman’s inner circle, so they can superficially treat patients with dignity and honor, but the emotional intimacy is missing. (3) Birth is not a crisis and when this is discovered, women tend to feel a power and victory they might not have experienced, generating greater confidence and self-esteem. As we tell our UHB stories, we get different responses. Some listeners are in awe and consider you a hero; others are fascinated; others keep their distance; some won’t care; others do not share their secret fear that you or the baby could have died. Because unassisted homebirth accounts for less than 1% of births in the U.S . and is met with opposition from professionals, friends and family members, many people prefer to keep a low profile. Sometimes, UHB is not met with opposition, but curiosity, since many people do not know women who have purposely decided to give birth without a doctor or midwife. Unassisted homebirth is an extremely intimate and special way to connect on a deep level. If the marriage is strong before the birth, it is likely that a newfound tenderness occurs after the birth. Lovers observe each other in new ways and new revelations are made. Husbands and wives usually experience a greater bonding. The yearning to become visible in your beloved’s eyes will be felt the moment a new addition arrives in your family. It's magical, mystical, and divine. The visibility that is most meaningful is the shared event that takes place inside the family bubble, an historical moment best experienced in private. It is an ordinary, yet extraordinary life event between two lovers. For a more comprehensive presentation of this topic, please refer to my book Unassisted Homebirth: An Act of Love.